Canada's Best-Selling Heavy-Duty Engine, the 6.7L Cummins Turbo Diesel producing 370HP and an impressive 800lb-ft of torque! This Cummins motor includes a standard "smart" Diesel exhaust brake that helps control the descent of your pickup by maintaining smooth braking on a slope. 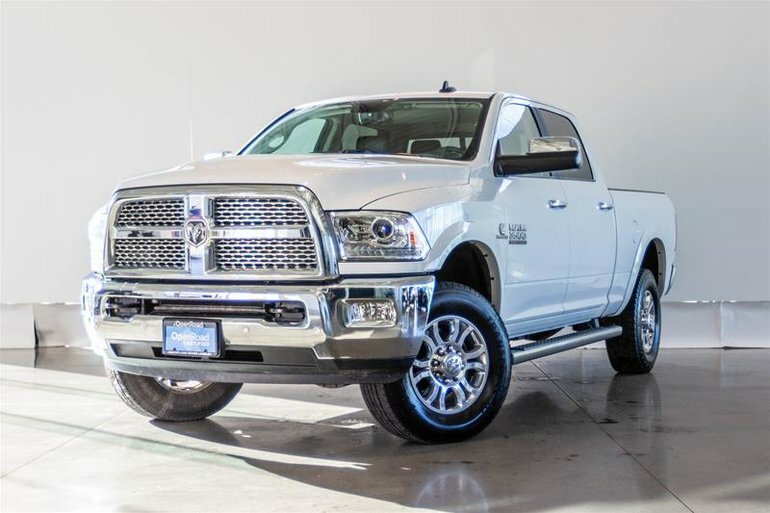 Maximum towing on the Ram 3500 can reach up to 31,210lbs depending on the configuration, towing is made smoother with the indispensable tow/haul mode that controls the trucks speed with more aggressive shifting schedules. Beyond this truck's astonishing specs, there is a refined and luxurious interior filled with amenities. Starting with the Parkview rear back up Camera, 8.4" UConnect infotainment system featuring Sirius XM, Apple Carplay, Navigation, Phone Connectivity, Temperature controls and more. Other amenities include Power 10-way driver and 6-way passenger seats both with heating and cooling, Leather Faced Seats with front bench seat, Heated Steering Wheel, Alpine Premium Sound System, Chrome power folding, heated mirrors with memory and so much more! Financing Available, Trade-ins Welcome. Visit Jaguar Land Rover Langley to test drive today. Interested in the 2018 Ram Unlisted Item Laramie ?